We’ve been hearing a lot of buzz around my6sense, a digital intuition iPhone app. The app imports RSS feeds and social streams, and senses what you like to read based on your own behavior, surfacing the most interesting content to you from your streams. And the Israeli-startup just recruited well-known tech blogger and consultant Louis Gray as its VP of marketing. Today, the startup is bringing its personalized content app to Android phones with a new app and is adding support for Google Buzz. 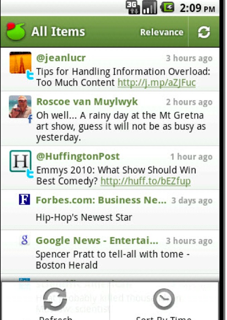 Once you sign in with your Twitter, Facebook, Buzz, and Google Reader accounts, my6sense will serve the content in your social streams in one interface. Using the company’s ‘digital intuition’ technology, the app will analyze which types of content and sources you click on the most and then auctomatically surface similar content as you interact with the app. While the app will display a channel with the most relevant, personalized content from social streams, users can also see content from all sources (news, RSS, blogs and social streams), and filter streams based on social network and more. And users can share items directly from the app. Gray compares the app to Amazon’s Recommendations engine, which also recommends books and more to you based on what you purchase. The difference, says Gray, is that my6sense focuses on your content and news choices, watching what items you skip in your social stream and what items you will read in full. My6Sense, which has raised $2 million in funding, also offers an API, which allows a content owner to plug the startup’s digital intuition technology on their own sites, which will surface personalized content that users click on more often. For example, professional social network Ecademy has been using the technology. Unfortunately, the app isn’t available on the web. And with the success of social news app Flipboard, the iPad poses a unique opportunity for my6sense as well. Gray says web and iPad apps are common requests by users and that the startup “won’t count any screen out” in future product development.